On Sept. 29, 2009, Robinson was convicted by a jury of the charges listed above and two felony counts of mayhem. On Dec. 11, 2009, Robinson was sentenced to 22 years to life in state prison in this case. On Jan. 14, 2011, the Court of Appeal vacated Robinson’s sentence and overturned his conviction on the attempted murder charges and sentencing enhancements based on an instructional error by the judge during juror deliberations. Robinson faces a maximum sentence of 22 years to life in state prison at his sentencing on Nov. 14, 2014, at 9:00 a.m. in Department N-13, North Justice Center, Fullerton. At approximately 6:00 p.m. on Feb. 24, 2008, Robinson bought a ticket for the horror movie “The Signal” at the AMC Theatre at 1001 South Lemon in Fullerton. The defendant was wearing dark clothing and sunglasses inside the theater. A theater manager asked security to watch the defendant after noticing that Robinson appeared agitated and aggressive when asked to show his ticket. The theater security guard observed the defendant carrying a container of alcohol and asked Robinson to put it in his car. The defendant left the theater. Approximately 10 minutes later, Robinson re-entered the theater and approached the concession cashier to ask if anyone had seen or turned in a “baggie.” He was informed that nothing had been found. The security guard then observed Robinson carrying an AMC cup, which he suspected might contain alcohol. Robinson refused to remove the lid of the cup to show its contents to the security guard. After being informed that he would not be permitted to see the movie without complying with security, Robinson got a refund for his ticket and again left the theater. Shortly thereafter, a box office cashier called the manager to report that a bag of hallucinogenic psilocybin mushrooms had been turned in to the box office. The manager contacted the Fullerton Police Department, who sent officers to the scene in response. At approximately 7:20 p.m., Robinson sneaked back into the theater. While checking the theater where “The Signal” was playing, the security guard noticed Robinson as one of four people watching the movie. He returned to the lobby to inform the manager and police, who had arrived in response to the call related to the bag of drugs. While officers were in the lobby, Robinson got up from his seat and approached Julio Sanchez, 38, carrying a folded pocket knife. Robinson attacked the victim by stabbing him five times in the head, arm, chest, and knee. The defendant continued to stab and slash at Sanchez until the victim was able to run into the lobby and escape. Robinson then approached Eloy Uresti, 65, and began to stab him in the arm as the victim attempted to protect his face. The victim attempted to crawl away, but Robinson followed. Robinson hit the victim in the head with the hammer end of the weapon and continued to attack Uresti until hearing the police officers enter the theater. The officers had been in the lobby when Sanchez ran from the theater covered in blood. Robinson fled the scene through an exit door leading into the parking lot. The two victims did not know each other or the defendant. Victim Sanchez suffered a permanent loss of mobility in his arm. Victim Uresti suffered nerve damage. Both victims explained that the attack affected their ability to work and participate in activities that they had previously enjoyed. After the attempted murder, Robinson fled to his brother’s Las Vegas, NV, apartment to hide. 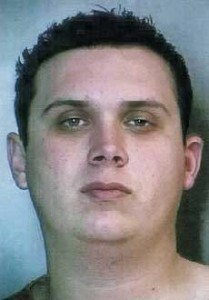 He was arrested on March 7, 2008, on a $500,000 warrant and was brought back to Orange County. On Dec. 11, 2009, Sanchez provided a written victim impact statement to the court in which he explained that Robinson not only emotionally and physically traumatized him, but also hurt his ability to financially support his family due to his disability, and took away his ability to do what he loves, surf.